Moaning behind her, D.C. McGuire plodded along disinterestedly, much as he had been doing all day. “Will you just shut up complaining for just five minutes. I’ve not had anything to eat either. I’ve not had a coffee and I’ve not had a fag so stop it or I’ll bloody well leave you here to decompose. D.C. McGuire laughed and threw a broken branch just ahead of Gemma, making her gasp. Gemma turned to look at McGuire, astonished by the amount of puerile twaddle that the man could come out with but suddenly screamed as her foot disappeared down a burrow and she fell head first into a jagged patch of brambles. “See, my point exactly. You couldn’t hurt a flea never mind a violent assailant! Have you chipped your nail varnish?” He extended his hand to help Gemma up but she brushed it away, sitting up to rub her ankle. McGuire bent over to have a closer look. Gemma crawled towards the spot where she’d stumbled and moved aside the autumn debris. Pulling away the leaves and dead grass, Gemma hesitated just for a second as her hand brushed against skin. Now grabbing furiously at the undergrowth, her breath caught and her heart pounded. She was touching a small nose and then hair; long fair hair. They’d found the missing girl. D.C. Gemma Dixon, D.C. McGuire and W.P.C. Wendy Brown climbed the steps that led to 18, Park Gardens; a detached sandstone villa in the classier end of Govan but still within spitting distance of the imposing Ibrox Stadium, home to Glasgow Rangers F.C. and the now cleared tenements and high-rise flats that had once dominated this part of the city. Little Mairi McClure’s mother opened the door to them, her red-rimmed eyes sunken deep into her face. “Come in, I suppose there’s news if you lot are here?” she stated more than asked. Following her into the spacious entrance hall, Gemma looked up at the sweeping staircase and the small chandelier that hung from the ornate ceiling and wondered how this family had got mixed up in a murder investigation. Joan McClure had now known for three days that her daughter was dead, murdered by some beast that had dragged her out of the garden by the back fence, leaving the swing and the trampoline abandoned on a sunny autumn morning. She’d only been six years old, small for her age and as bonny as any bairn could be with her long blond hair and a smile that was brighter than the Christmas lights in George Square. “I know you all did your best hunting for her like, but I just wish you could have found her, rescued her before….before….,’ and at that Mrs. McClure started to sob tears that she didn’t think would ever end. Sitting in the darkness of her daughter’s bedroom, Joan McClure quietly sang to herself as she folded her daughter’s clothes, lifting them to her face to smell the last traces of her child. Folding down the pink covers of her little girl’s bed, she smoothed the sheets before turning to close the curtains and turn on the night light. Before leaving the room she switched on the CD player to begin Mairi’s favourite ‘Katie Morag’ story. Quietly she closed the bedroom door behind her and crept silently down the stairs. 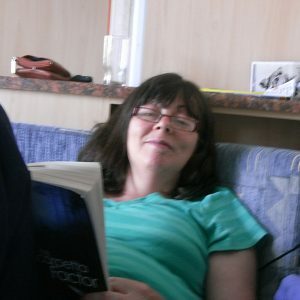 Fiona Johnson lives in Argyll, Scotland and writes under the name ‘McDroll’. Her love of all that is dark in Scottish crime writing can be found at ‘I Meant to Read That…’ and while her own short stories also dwell on the darker side of life, a twist of Scottish humour is never far away. You can follow her blog, and via @mcdroll on Twitter.